English Olympiad™ is a great journey with the motto of “Inspiring Leadership”. We have about 3500 Campus Ambassadors in 8 Divisions of Bangladesh. Recently The Daily Star Featured English Olympiad as a Nation Building Activities. About 35000 participants registered and many of them participated at divisional selection rounds in 2017. Last year we tried to reach 5 million people to spread the necessity of Learning English to be a global citizen and to lead the world for a better tomorrow. A highly dedicated Campus Ambassadors team is active with the leadership of 8 Divisional Coordinators. We organized many workshops and conferences for the interested participants and young entrepreneurs to show them the right way of learning English to compete globally. We have the unique URL in Twitter, Instagram, LinkedIn, YouTube and a very responsive Facebook fan page to have a good conversation with participants and guardians. 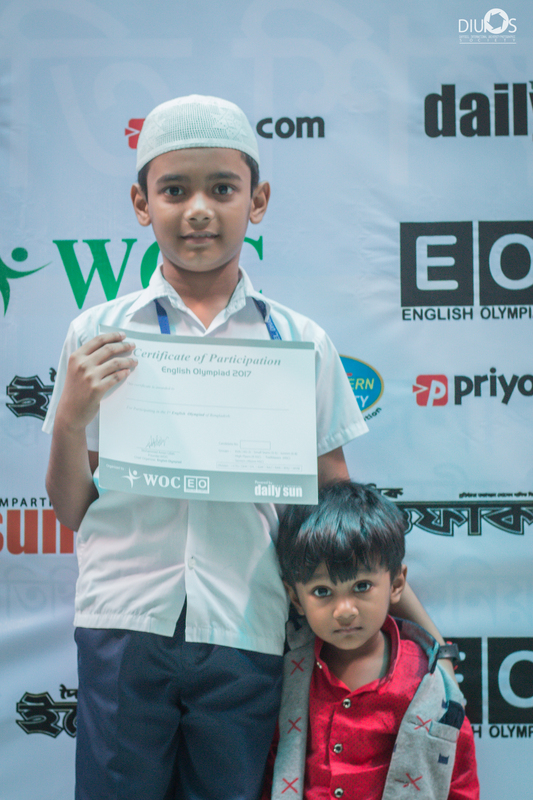 English Olympiad is the biggest platform in it’s kind where all kinds of students, Institutions, participants and young leaders with a very creative age groups. 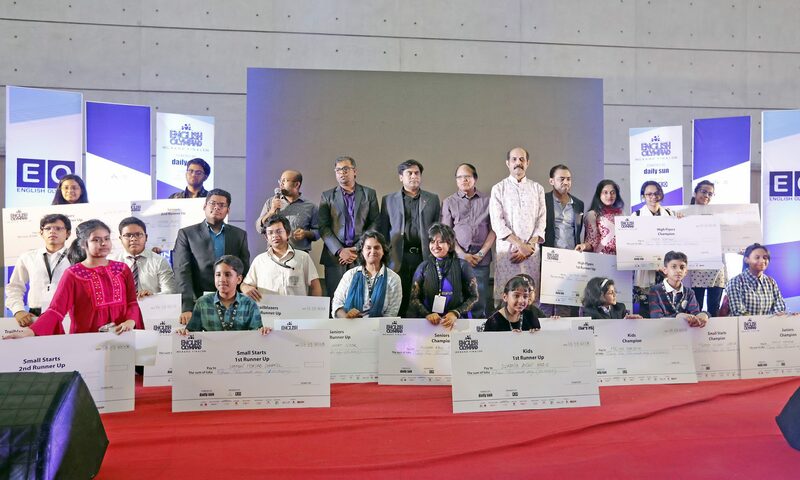 Country’s Leading Media Group East West Media Limited’s National English Daily newspaper (Bashundhara Group) The Daily Sun was the powered by partner and we had been publishing Competition Materials and all the activities, news and articles with pictures here for 10 Months in 2017. Students were preparing from this and we made questions on it with a very active and talented English Olympiad Research Team from IBA, Dhaka University & WOC Team from more than 100 Countries. This time we have many more prestigious partners and supporters. We are going to publish books for our participants. Recently #TeamEO met with Mr. Saber Hossain Chowdhury, Ex-President of Inter-Parliamentary Union to work together for a better world as WOC will call minimum 25 countries to join with us for Global English Olympiad. We have six groups for 6 different classes called: 1. KIDS (till class 2) 2. Small Starts (3-5 Classes) 3. Juniors (6-8 classes) 4. High Flyers (9- 10 classes) 5. Trailblazers (11-12 classes) 6. Seniors (any student above HSC). 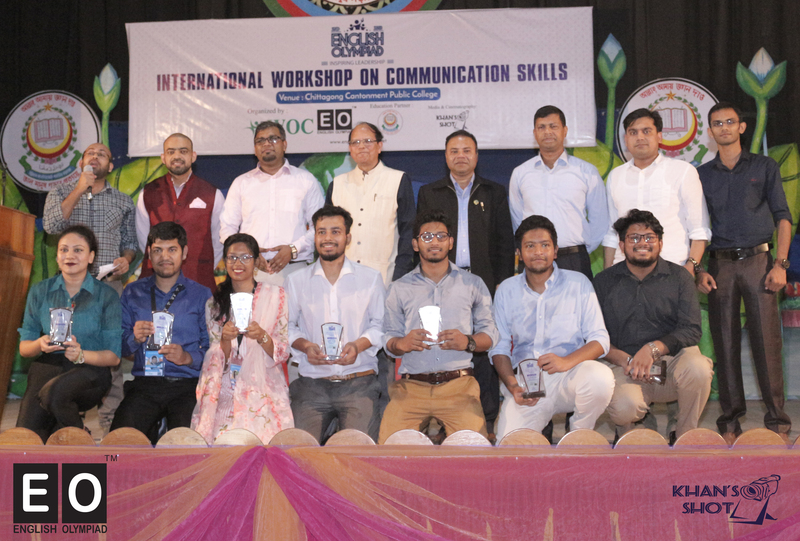 In 2018, English Olympiad is working to organize 64 “District Level Selection Rounds and International Workshop on Communication Skills.” There are 3 rounds in this competition named Selection Round, Theater Round and Grand Finale.